The large pool is a focal point for this light-filled, 3-bedroom villa. Kids can play without getting in each others way, and you can lounge on the pool deck to catch a few rays. The pool is long enough to allow for lap swimmers if you’re trying to keep up an exercise regimen while on holiday. You will love the aromatic morning walk to pick up freshly baked croissants and baguettes at the nearby Boulangerie and returning to the villa, pouring a hot cup of coffee from the espresso machine and lounging on the dining terrace to enjoy your French pastries and the spectacular view. While you’re there, why not spend a little time with your kids by setting up a board game on the covered patio and challenging them to a few rounds? When the games are over and everyone is ready for a bite to eat, there are a number of local restaurants just a 10-minute drive away. Walk to the Boulangerie for French Pastries! 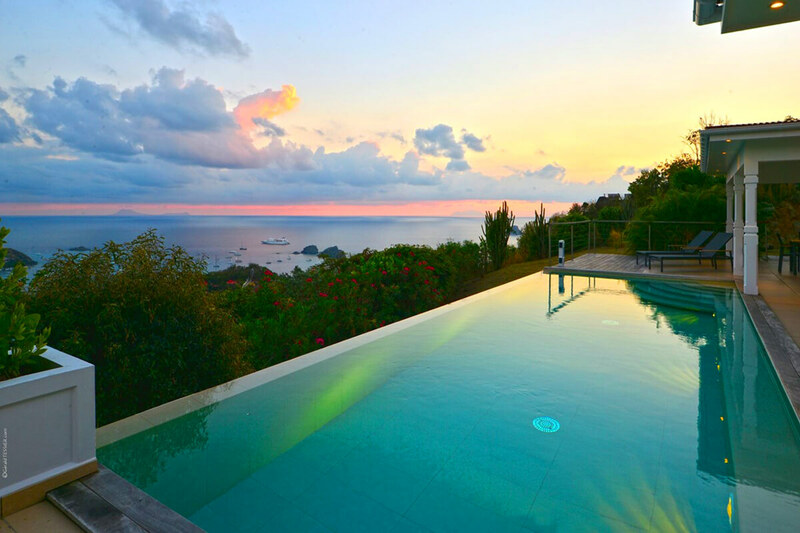 Cactus Villa is a 3-bedroom, 3-bathroom residence on the heights of Colombier, northwest of St Bart. The view of the Caribbean Sea and the entrance of Gustavia’s harbour, capital of St Bart, make it an ideal holiday home. Cactus is perfect for a vacation with friends (equal bedrooms) or with family (2 of the bedrooms are under the same roof). There is a long heated pool in front of the sea that is great for swimming enthusiasts. It has an optional counter-current feature that is great for an aquatic workout. Each room offers sea views. Bedroom 1 furnishings include a queen-size bed, air-conditioning, fan, safe, TV, DVD, iPod dock, outside shower, bathroom with shower. Bedrooms 2 and 3 are furnished with a queen-size bed, air-conditioning, fan, TV, DVD, iPod dock, safe and a bathroom with shower.